The app comes with advanced features which allows you to import / export products and options and as well as categories into J2Store. You can import product data including options,variants,advance price etc. You can also export the products / options / categories and see the fields that are supported by the app. Export your data in following three file formats (.csv, .xls, .xlsx). However, you should use only .csv file format for importing. Error reporting must be disable. Goto system -> Global configuration -> server-> Error Reporing set to "None"
Set Batch limit in setting page. When you import products, you must import the options and variants too. Otherwise, the app will not work properly. Download the app from our site's extensions section and install it using Joomla installer. 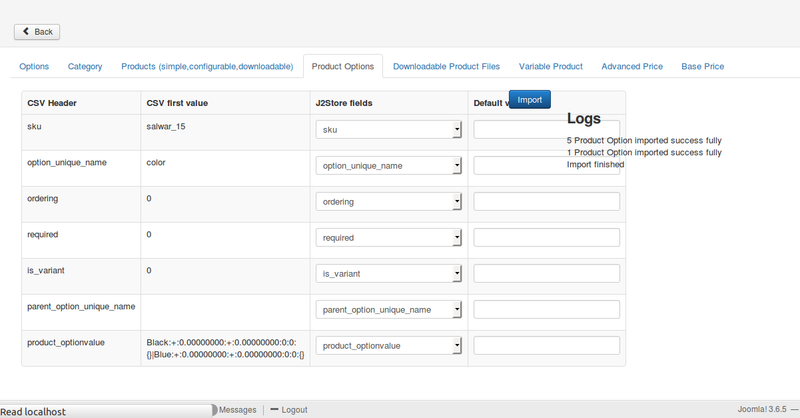 In Joomla backend, go to J2Store > Dashboard > Apps and click Enable on Import J2Store Products. After enabling, click Open to import / export the products. How to import new options ? Open Import J2Store Products app. You can see the active and opened tab named "Options". Use this tab to update existing options and import new option to J2Store > Catelog > Options. Below step by step instructions help you to import new options. Now go inside the Options tab and choose the file, set the delimiter, set character encoding and click Import button. How to import category ? Click on Export button to export the categories from Content > Categories in .csv format or .xls format or .xlsx format. How to import new Products? Import / Update Simple, Configurable, Downloadable product types using this tab. Variable product type cannot be imported / updated here. Before importing products by creating new csv file by your own, it is better to export the existing products and see how the file structure is. Click on Export button to export the products from J2Store > Catalog > Products in .csv format or .xsl format or .xlsx format. When importing new products via csv, you need minimum visibility, product source, sku, price, title, catid, product_type otherwise you can't create new products.j2store_product_id - For creating new product, you can leave this column empty. The product id will be updated automatically, after importing.product_source - Choose your content source here. For example : com_content, com_k2.Visibility - This is place to enable visible in storefront. Enter 1 to make this product visible in store front.SKU - It is most required field. Without this the product cannot be imported or updated properly.Price - Enter the price of the product.Title - Enter the product title.Cat ID - Enter the ID of the category to which the product should be assigned.product type - It is one of most important required field. You must enter the type of product here. For example : simple, configurable, downloadable. Save the .csv file. Now go inside the app > Products tab and choose the file / set the delimiter / set character encoding and click Next. Updating and adding product options and product option values can be possible by using this tab. Click on Export button to export the product options from J2Store > Catalog > Products in .csv format. If you would like to add new option to any one of your products, you must set 1 to has_options field when importing products using products csv file. Now open the product_options.csv file. When importing product options via csv, you should need atleast SKU, option_unique_name, product_optionvalue. How to import downloadable product files ? Do you have 100+ downloadable products and want to change downloadable files are all products ? It is very frustrating to open / edit each product for changing downloadable files right ? Don't worry about that. You can easily do this by our Advance CSV import / export app. Open the app and move to Downloadable Product Files tab where you can export all your downloadable files in .csv format or .xls format or .xlsx format. File path - Enter the valid path of your file. How to import variable product ? Before importing variable products by creating your own csv file, it is better to export the existing variable products to see how the file structure is. To import variable product, you don't need any variant related fields (sku, price,etc). The following are minimum required fields to create variable product.j2store_product_id - You can leave this column empty. The product id will be updated automatically, after importing.product_source - Choose your content source here. For example : com_content, com_k2.has_options - This should be set to 1.Visibility - This is place to enable visible in storefront. Enter 1 to make this product visible in store front.Title - Enter the product title.Cat ID - Enter the ID of the category to which the product should be assigned. Save the .csv file. Now go inside the app > variable products tab and choose the file / set the delimiter / set character encoding and click Next. After creating variable product, you should add variants to the product. Use this tab to import options to the variable product. Save the .csv file. Now go inside the app > variable product options tab and choose the file / set the delimiter / set character encoding and click Next. After importing successfully, the regenerate button will be shown to generate variants for the options imported. See below image. After generaing variants, use this tab to update SKU, price, stock, dimensions, image, etc for variants. New variant cannot be created here. Click on export button to see the newly generated variants. Save the .csv file. Now go inside Variants tab and choose the file / set the delimiter / set character encoding and click Next. If you would like to update product's base price and advanced price alone, you can do this in Advanced price tab (to update advanced price) and Base price tab (to update base price). Click on Export button to export the price from your Products in .csv format. If you would like to import / update pricing, open the csv file and change the field values. You should have the product sku to update / import price. Save the .csv file. Now go inside the respective tab (for importing advance price, go to Advance price tab. For importing base price, go to Base price tab) and choose the file / set the delimiter / set character encoding and click Next.